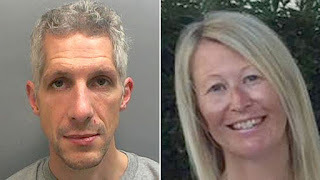 Police inspector Darren McKie has been jailed for at least 19 years for the murder of his wife Leanne. Sentencing McKie to life imprisonment at Chester Crown Court, judge Mr Justice Spencer said: "You strangled her to death in the family home. "It was a cruel killing. "Then, abusing your knowledge with criminal investigations and abusing the public trust in you as a senior police officer, you set about disposing of your wife's body in a callous and despicable way." He added: "You have robbed your children of their mother. You have robbed Leanne's parents of their beloved only child." Mrs Mckie, a fellow police officer with Greater Manchester Police, was found strangled in Poynton Lake, Cheshire, on September 29. She was described by colleagues as "popular and professional".